Gerber has an unfortunate history of excluding dads in its direct mail pieces, on its website, and in its My program. But things could be improving – that looks like a man’s hand feeding the baby on its website. And a recent magazine actually acknowledges that the featured baby is a “him,” a possible future dad that will eventually be disregarded by the very company using his likeness to sell its products. It’s another piece of a portfolio that’s confusing and erratic. However, to top it off – at least for our staff – Gerber has blocked us from following its company on Twitter. Now, Twitter blocking certainly has its place in life, but to prevent one entity from communicating with another? Why? The words close-minded and censorship come to mind. Hey Gerber, we’re only trying to help. 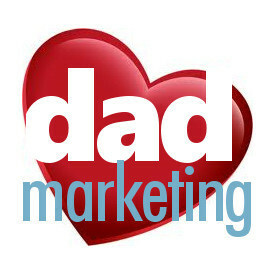 Factual proof created by your very own marketing team indicates you have a practice of excluding dads, and that’s wrong. Dads buy your products. Dads care for children. Dads count too. We’d love to chat, but it’s kind of hard to do that right now. Drop us a note.